“This could be eight different bands from eight different corners of the world except it’s more like one fevered collective musical brain firing off ideas like skyrockets. Look, there’s one exploding above you right now,” wrote Bernard Zuel, in the Sydney Morning Herald. SMH. 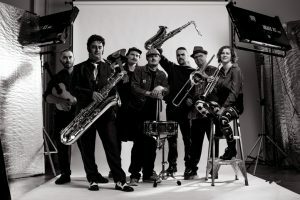 Mariachi, Balkan, New-Orleans swing, Spaghetti- Western, Cabaret, Film Score, Cumbia, Punk-Rock are all represented in this magnificent ensemble. Their recent LP, Home, received extensive radio support in Sydney including album of the week on Eastside Radio and airplay on community radio stations 2SER, FBi, ABC Radio National and RRR in Melbourne. Be prepared to be surprised and delighted.